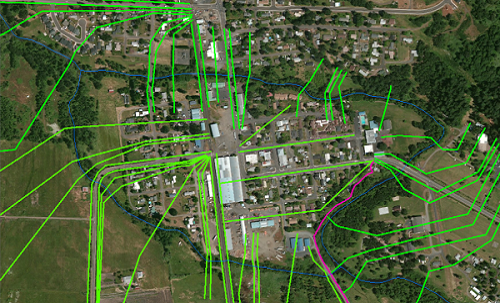 Flood Insurance Study and Flood Reduction Alternatives Analysis for the City of Turner (OR) | WEST Consultants, Inc.
A FEMA Flood Insurance Study was conducted along approximately 4.2 stream miles of Mill Creek and Mill Creek Bypass in the City of Turner, in Marion County, OR. As part of the study, a flood risk reduction alternatives analysis was conducted to understand what modifications to existing hydraulic structures, channels and floodplains could be implemented to reduce flood risk within the City. Ground surveys for approximately 53 cross sections and 12 hydraulic structures were completed using a combination of RTK GPS and Optical Total Station equipment. This allowed for all of the survey data to be quickly and easily geo-referenced to existing National Geodetic Survey (NGS) monuments, resulting in easy integration with available LiDAR topographic data. HEC-RAS was used to perform the 1-D hydraulic analysis. Water surface profiles for the 2-, 5-, 10-, 25-, 50-, 100-, and 500-year flood events as well as the 100-year floodway were determined. All geometry data within the hydraulic model were geo-referenced, so the output data could be post-processed using automated mapping and display techniques in HEC-RAS and ArcGIS. After thorough in-house Corps QC reviews, the completed products (including the hydraulic model, flood profiles, floodway data tables, work maps, FBS audit results, MT-2 forms, and all backup data) were submitted to FEMA as a Letter of Map Revision for incorporation into the Flood Insurance Study for Marion County and Incorporated Areas.